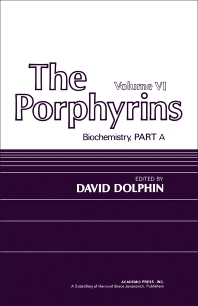 The Porphyrins, Volume VI: Biochemistry, Part A deals with the biochemistry of porphyrins, their precursors, catabolic derivatives, and related compounds. The book covers the biosynthesis of porphyrins and chlorophylls; the formation and metabolism of bile pigments in animals and plants; as well as the synthesis, characterization, and chemistry of the bile pigments and their derivatives. An account of the historical and clinical aspects of porphyrins and bile pigments is also given. This volume is organized into 12 chapters and begins with an overview of protoporphyrins and their metabolic intermediates, paying particular attention to their synthesis and biosynthesis. The discussion then shifts to the biosynthesis of porphyrins and chlorophylls; the in vivo formation and metabolism of bile pigments such as biliverdin and bilirubin; and yellow, green, and blue bile pigments. The reader is then introduced to bile pigments of plants including phytochrome and phycobiliproteins; the general structures and nomenclature of bile pigment derivatives; and the Stokvis reaction. The book also considers the clinical chemistry of porphyrins, and then concludes with a chapter on milestones in the history of bile pigments. This book will be of value to inorganic, organic, physical, and biochemists interested in the biochemistry of porphyrins.